Why Sell Your Gold to Austin and Warburton? Brenda Warburton, of Ann Arbor-based jeweler Austin & Warburton, crafted a bracelet that was honored by the American Gem Trade Association. Niveet Nagpal, a principal with Omi Gems of Los Angeles, chose Arizona jewelry designer Judith Evans to design a special bracelet of sapphires, diamonds and platinum intended for the AGTA Spectrum Design Contest for 2011. Warburton executed Evans’ design using more than 400 melee diamonds and showcasing the 14 carats of blue sapphires. 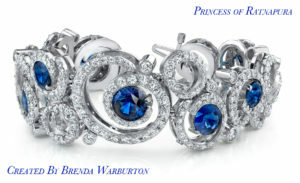 The American Gem Trade Association recently announced that the bracelet, known as the “Princess of Ratnapura,” had won top honors for 2011 in “Best use of Platinum and Colored Gems.” The bracelet recently attracted attention on the runways of the Golden Globe Awards when it was worn by Mary Hart of Entertainment Tonight as she greeted and interviewed Hollywood stars. In late October 2010 Mr. Niveet Nagpal flew to Detroit to visit the shop of Brenda Warburton and meet the renowned artist. Mr. Nagpal, a principal with Omi Gems, Inc., had assembled a suite of exceptional Sapphires, 14 carats in total. He had already hired Arizona jewelry designer Judith Even to design a special bracelet intended for the AGTA Spectrum Design Contest for 2011. The Deadline was dangerously close. After the visit the request came, would Brenda build the bracelet and commit to having it in time for the judging in New York in November. Brenda indeed built the bracelet. 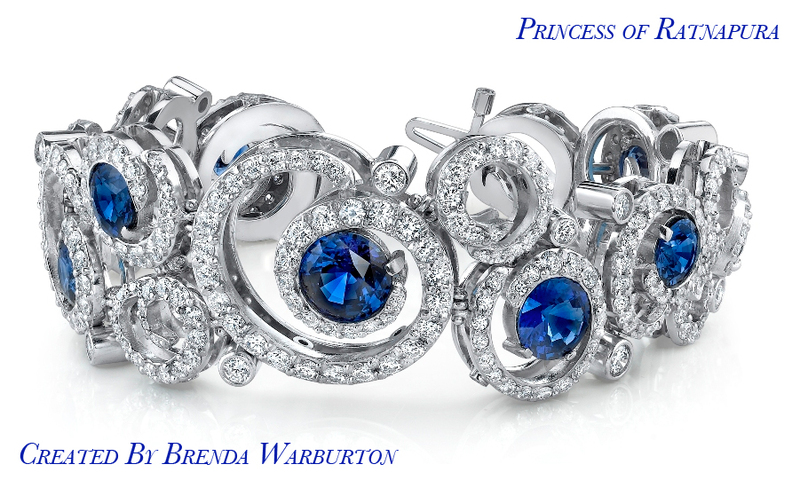 Using almost 5 ounces of platinum, Brenda executed Judith’s design using over400 melee diamonds, totaling 8.96 cts. and showcasing the 14 cts. of exceptional blue sapphires. By late November word came from AGTA that the bracelet, known as the “Princess of Ratnapura” had won top honors for best use of platinum and colored gems! The American Gem Trade Association Spectrum contest is 26 years old and is the most important Gem and Jewelry Design contest in the world. The attraction to Brenda by Omi gems was based primarily on Brenda’s history of having won the contest herself 3 times, a remarkable feat in a very competitive industry. Similarly, Ms. Evan’s design was classic in nature and required expertise and engineering beyond most craftsperson’s talent due to the asymmetric pattern and tapering swirls of diamonds.